I just got back from Denver and a visit to my BFF, Shaun. You last saw her in our adventure to Connecticut where we accidentally went to Massachusetts and then found the only town in America with 4 Main Streets. This time we found gnomes and chocolate. But, alas, not chocolate covered gnomes. The natural world is not ready for that yet. 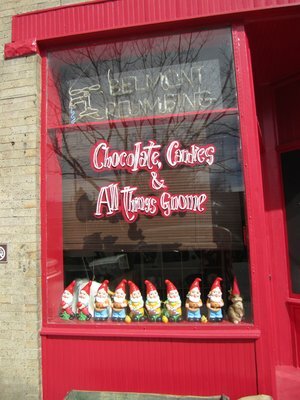 Chocolate, Candies, and All Things Gnome. What is not to love? It was a cute shop that sold garden gnomes and hand-crafted chocolates. Let me rephrase. Cute garden gnomes and unbelievably good hand-crafted chocolates. Walking through the door is like walking into a fairy forest. The walls are muraled to look like you are surrounded by gnomes frolicking in an ancient woods thick with trees. When you take the stairs up to the second floor the banisters are shaped like gnarled tree branches and you emerge into the canopy of the forest. I tried a little of everything. The cherry cordials, the chocolate covered salted caramels, a caramel and pecan “turtle” (apparently the word “turtle” in reference to a candy is trademarked, who knew), a pear truffle, and a raspberry truffle. They were all amazing! Thank goodness they sell them only by the piece or I would have bought boxes of everything and would now be in a diabetic coma. But this is only the downstairs. There is also an upstairs that feature commercially made penny candies for the kids. Frankly, you’d be an idiot to pass up the wonderfulness of the freshly made confections on the first floor for the Swedish fish made 3 years ago in Finland. But, hey, to each their own, right? On the opposite side of this experience was the Tea we had at a local mansion. I do believe that if Shaun or I had been millionaires we would have decorated in the exact same way. It was crammed full of southwest oddities and silver and art. And pictures of cows. She really loved her cows. Fascinating. And now I’m back in the real world. Just in time for the end of school. The last week of school is ending up being one of the busiest weeks ever, because on top of my regular working at the pre-school and usual crazy life I will be…. Sunday: Attending 2 parties that day as well as recover from the concert on Saturday. Monday: Secure our beach house rental and pick up party supplies at Cost-co for the school. Tuesday: Make savory phyllo dough turnovers and a dozen chocolate eclairs for the graduation ceremony at E’s school. Wednesday: Buy gifts for the toddlers at H’s school. Participate in my first Parent Council meeting. I’m excited and nervous about this one. Friday: Host H’s end-of-school party, go to E’s end-of-school picnic, and bring the cheesecake I made on Thursday to a staff potluck on Friday. And on the seventh day I shall rest. And post all about my week of food. Wow! But you know how wonderful it is to have homemade food at these celebrations and receptions! It really does make a huge difference. But everything really does happen all at once. Gnomes, chocolate, tea….why do I feel like I am inside a Harry Potter movie?